Bachelor of Theology (University of Otago); Master of Theology, (Melbourne College of Divinity). A Gold field with a wavy Blue diagonal stripe bearing a Silver Shepherd’s Staff. The top of the shield is separated by an indented line and is maroon bearing an image of the Blessed Sacrament bearing a Black Chi Rho Christogram and within an array of Gold. 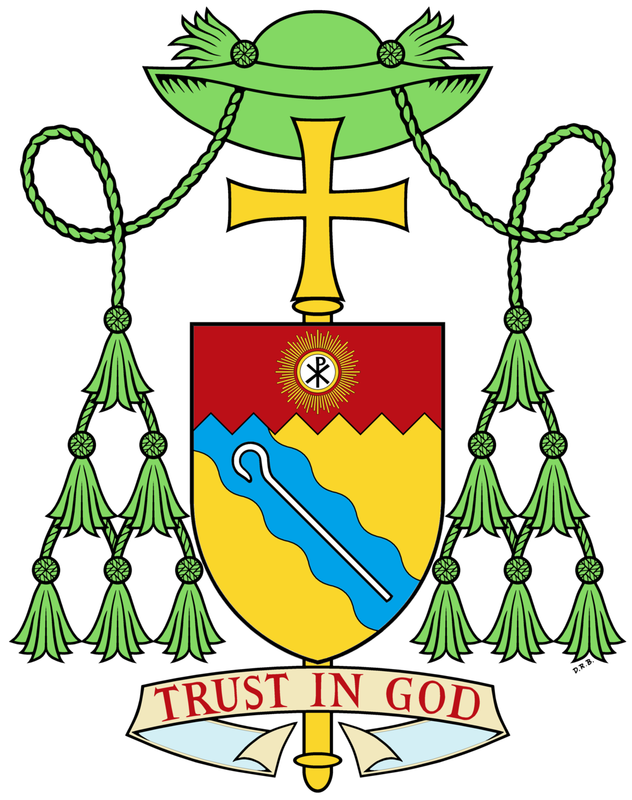 The Bishop’s motto “Trust in God” completes the design. The coat of arms has a gold field referencing the plains bisected by a wavy blue band representing the Aparima River with a Shepherd’s Staff referencing the Bishop’s role as shepherd of the people of the Church of the Diocese of Dunedin. The top band is separated from the body of the shield by an indented line referencing the Takitimu Mountains and bears an image of the Blessed Sacrament with a black Chi Rho, one of the earliest forms of christogram, formed by superimposing the first two (capital) letters—chi and rho (ΧΡ)—of the Greek word ΧΡΙΣΤΟΣ (Christos) in such a way that the vertical stroke of the rho intersects the centre of the chi. The Sacrament is surrounded by a golden splendour. The colours also reference the two main provinces of the Diocese of Dunedin. The blue and gold reference Otago and the maroon references Southland. The arms were designed by Father Guy Selvester and Richard d’Apice of the Heraldry Society of Australia Ecclesiastical Working Party and were illustrated by Roger Barnes of the Heraldry Society of New Zealand. The shield of the arms is ensigned with a Galero (or Roman hat) with six fiocchi (or tassels) on each side in green as is traditional for a Bishop. Educated at Heddon Bush Primary School and Central Southland College. Ordained for the Diocese of Dunedin 13 December 1989 at St Peter & St Paul Church, Nightcaps, Southland, by Bishop L A Boyle. Worked for 10 years in various parishes in Otago and Southland as well as Chaplain to Verdon College, Invercargill, 1990 - 1993; St Peter's College, Gore, 1994 - 1995; Kavanagh College, Dunedin, 2009 - 2017. A member of the Diocesan Priests Council and College of Consultors. Appointed Formator and Spiritual Director, Holy Cross Seminary, Auckland 2005-2007. Consecrated the seventh Bishop of the Diocese of Dunedin on 26 April 2018.